Announced five years ago, Blackmagic’s original Pocket Cinema Camera was a compact video shooter that delivered RAW 1080p recording in a body perfect for stuffing in your jacket. 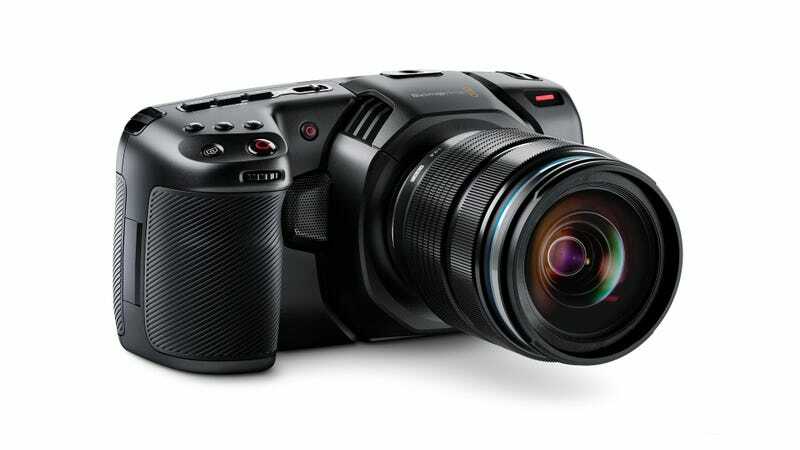 Fans of the original will be happy to know the company’s finally got a successor, unsurprisingly named the Blackmagic Pocket Cinema Camera 4K. As the name suggests, it’s bringing 4K recording (4096 x 2160) to the mix, along with a redesigned body, support for either 10-bit ProRes or 12-bit RAW recording, and forward-looking connectivity options perfect for videographers looking to tote as little gear as possible. The new camera is built out of carbon fiber, and uses a larger Micro Four Thirds image sensor compared to the last Pocket Cinema. It also has a 5-inch touchscreen that lets you control a variety of settings without fiddling with dials (though you can if you want). The Blackmagic Pocket Cinema 4K is cheaper than the $2,500 Panasonic GH5s, another mirrorless camera capable of recording 4K RAW footage, and it’s packed with a variety of ports, including USB-C (which lets you record to an external SSD), as well as compatibility with SD, UHS-II, and CFast 2.0 cards. There’s no in-body stabilization, which is a downside unless you’re shooting with a lens with built-in image stabilization, or you’re shooting on with a stabilizing gimbal or tripod. That’s a fair assumption considering the professional target audience for this camera. Whether or not this camera is suitable for you depends on what you’re using it for. You can capture some pretty high-quality 4K footage on mirrorless cameras already, though, you’ll be missing out on the range of editing options afforded in post-production when dealing with uncompressed video footage. It could also serve as a “cheap” addition to your existing film setup, in case you need an extra camera to capture some high-quality B-roll footage. In short, a camera that records uncompressed video in the form of ProRes or RAW footage is incredibly useful, especially when it’s under $2,000. Sure, you should probably pair it with a nicer Micro Four Thirds lens but you’re a professional, you’ve probably got one layin’ around somewhere.